I hope your week is going well and that you are keeping warm (for those living in the northern hemisphere). Here it is -13C (9F) and snowing (yay for winter). I have done a bit of stitching these last few weeks on some smaller projects and one of them fits into the Gifted Gorgeousness SAL hosted by Jo over at Serendipitous Stitching (go over there to see the other gifts stitched this month). Jo is always holding community projects and blog hops and is starting to look for bloggers wanted to participate in the Christmas advent calendar. Shoehorning in projects is always welcome so even if I am not doing any specifically Christmas-styled projects I will be signing up and encourage everyone else to get involved. I have finished up some more the of the flowers on the Energetic Tree that is a gift for my brother and his partner as a move in present / Christmas projects. I am all finished and just need to figure out how to finish / frame. I have made a couple of colour changes to the piece because I like purple and red more than yellow. This was the first time I used Jacobean couching and I think the look is very striking. I also started another embroidery piece that will be a gift for my sister, the shoe collector. It is a small and fun design and the fabric is a high count and nice to stitch on. Now for the piece that I am shoehorning in to this months GG. This was a gift for my soul. This is a piece from the XStitch magazine that I received last month. For those of you who are not familiar, the first magazine was released a few months ago (revolution) and has some political projects. 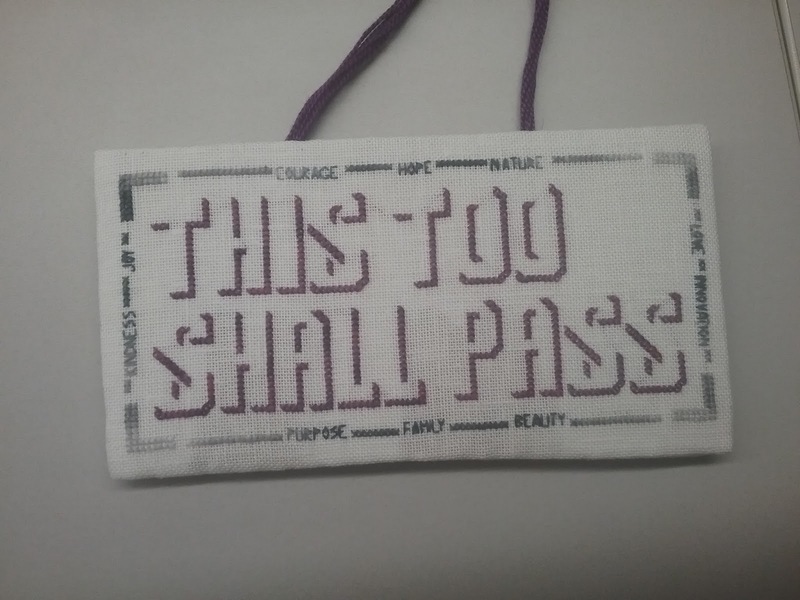 I made some adjustments to the piece including just using one colour for the words, although it is variegated, and adding the border to the outside. I made this for work for when I get so frustrated and need to focus on the big picture and see the what is truly important to me and what is always true. I found this piece very cathartic and it is now at work. I did a quick finish but it seems to be holding together well so far. I will clean it up over the holidays. Beautiful work on your embroidery. I love our finish. 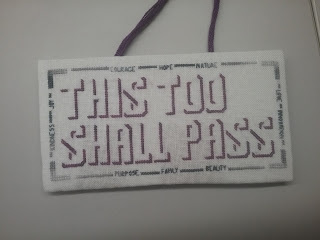 This too shall pass is something we all need to remember.